What makes a quilting retreat really great? To me, one of the best things about a quilt retreat is the focused time to quilt, and anymore a retreat seems to be the only time in my busy life that I actually focus on and enjoy creative sewing. But at least as important to me are the friendships and the time shared: walking, chatting, enjoying a meal, sharing a technique or two. To make sure that my next retreat gives me time to enjoy all these wonderful things, I’m on the hunt for an FLBQ: a Fast Little Baby Quilt! You can see all the reasons why here, but in short, I want a simple, fun and fresh project that I can complete in one relaxed weekend. In other words, I want it all: friendship, relaxation, creative fun! The fabric choices in this single-shape baby quilt first caught my eye! 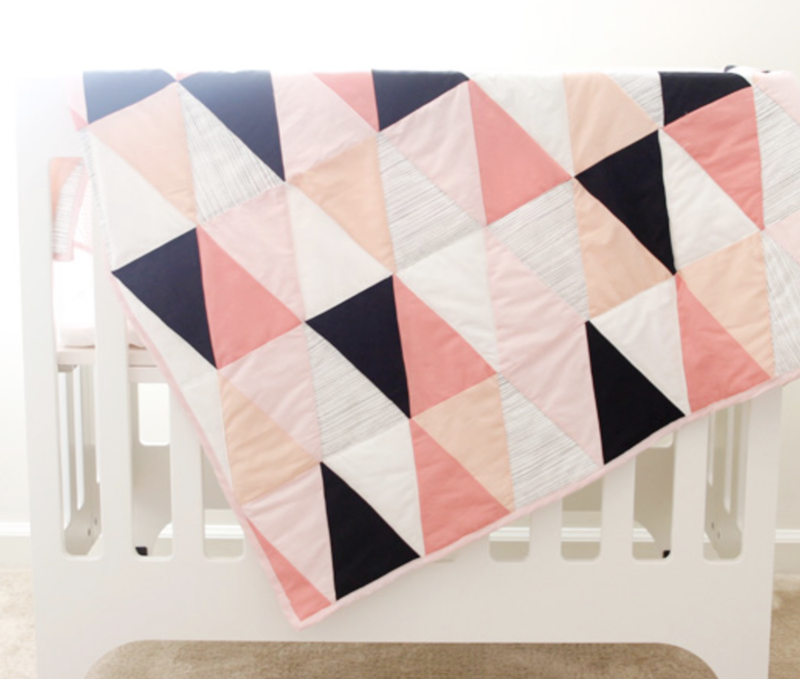 Kate of See Kate Sew posted this darling Ombre Baby Quilt…and then updated it with an improved pattern piece and detailed instructions for getting those super-sharp triangle points. (I think it’s awesome that she followed through on the improved post!) So be sure to check that first post for inspiration, and then the second one to get the updated bits. What I love about this design: Simplicity. A few fabrics, one pattern piece, and super-cute results. Kate’s peaches & pinks fabric choice are really fresh and inspiring to me, and easy to visualize in blues & greens for a boy, or maybe yellows & grays for a gender-neutral option. It’s nice that the pattern is free, and so are Kate’s bonus instructions for a matching chandelier mobile to hang over the crib, which of course translates to more money for fabric shopping! While the instructions aren’t super-polished, I think they will be easy to follow and I’ll definitely be referring to Kate’s post on achieving sharp triangles. Kate has stitched-in-the-ditch, but I'd probably go for an overall design. So I’m now up to three choices for my FLBQ...and I love them all! What do you think? What would you stitch on your perfect quilt retreat? 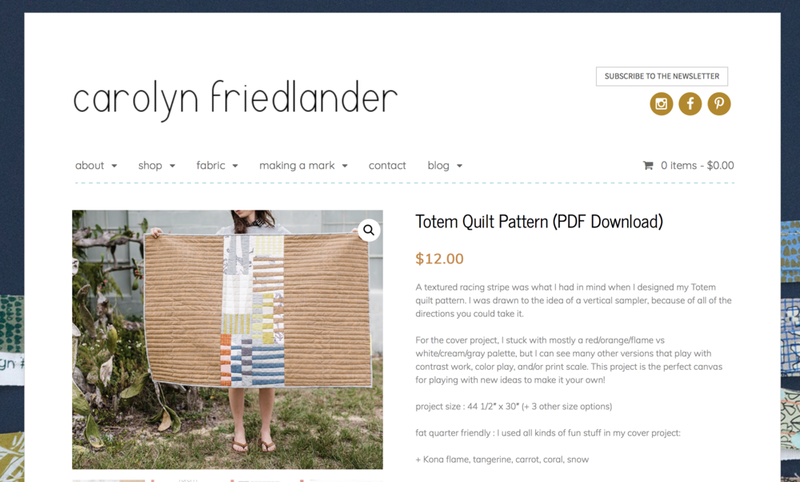 The Totem Quilt from Carolyn Friedlander is one of my inspirational options for an FLBQ (that's a Fast Little Baby Quilt!) to stitch up completely on a long weekend retreat! In Tuesday’s post I wrote that I’m looking for a retreat project that supports the reasons I go on retreat to begin with: relaxed time with friends, and a chance to be playful, creative and productive. I think a Fast Little Baby Quilt—FLBQ—is going to be just the thing! The first one up for consideration is Carolyn Friedlander’s Totem Quilt; it caught my eye a couple weeks ago, and I haven’t been able to get it out of my mind! What I love about this quilt design: an exuberantly pieced center section framed on opposite sides with simple and speedy solid pieces. I’ve never paper-pieced (really??? I can’t believe it myself!) so it would definitely be a new-to-me technique, but I’m also confident enough to do some of my own piecing in the center area. The quilting Carolyn shows is simple--one of my requirements!--but with playful touches. I would probably consider using this pattern as a base, but arranging various pieces to create a size that would allow me to complete it on the retreat timetable. With just a little dedication, I think the Totem Quilt could be a really gratifying weekend quilt retreat project! There is more FLBQ inspiration to come in the next couple days! What would you choose? Quilt Retreat Quandary: What to Stitch? With chill November rains streaking my windows, winter has moved in to Oregon on it’s calendar schedule, along with thoughts of tucking in to some quilting. My friends and I are starting to think about a spring retreat, and the logistics of who, where, when, and how are the easy parts. The hard part for me should really be the fun part: what to sew? That’s the decision I seem to agonize over the most, and I’ll bet you know the feeling of doubt surrounding choosing a weekend quilting project: am I biting off too much for one weekend? Will it turn into my newest UFO? Will I still like it after I’ve invested time and money into it? At one time in my life I was a ‘daily quilter’, at my machine every day. But things change and now I make quilts only occasionally, purely for the creative joy, always for people I love, and usually on retreat…I don’t want them to complicate my life! I’m looking for project choices that support the reasons I go on retreat to begin with: relaxed time with friends, and a chance to be playful, creative and productive. So for this next retreat, I’ve decided to make a fast little baby quilt: an FLBQ. I won’t be committed to looking at it every day of my life, so I can feel free to let go and play with color, print, and technique. It’s smaller, so my investment in fabric and materials is lower. I know that, as a future gift, it’s an expression of love so pure that even infantile indignities like spit-up can’t affect it’s value to the recipient….so neither will small sewing imperfections. I’ll choose something I can realistically make in a weekend, so I can pack up on the last day of quilt retreat feeling satisfied and accomplished, without adding another UFO to my to-do list. And maybe best of all, with an FLBQ or two in the bag, I’ll be ready to bestow a hand made, heartfelt token of joy the next time a baby shower rolls around. So the hunt is on! I’ll be looking for a FLBQ pattern with some playful aspect: a new-to-me technique or one I can adapt to my own stitching preferences. I’ll share my contenders over the coming week. If you have ideas or a favorite pattern to share, let me know!